The Meta Keys field allows you to add arbitrary pieces of information to entries identified by a user generated key. You can set default keys, and choose different output types by key or named key. It attempts to provide some handy filtering hooks for your datasources as well. Upload the /field_metakeys folder to your Symphony /extensions folder. Enable it by selecting the "Field: Meta Keys", choose Enable from the with-selected menu, then click Apply. You can now add the "Meta Keys" field to your Sections. You can set a number of default keys in the Section Editor, these will appear when you first create an entry. If the default keys aren't filled with values,they will be removed with the duplicator upon saving. If you want to assign a default value to a key, use the :: syntax. eg. Colour::Red, which will fill the Key with 'Colour' and the value with 'Red'. The usual Symphony validation applies to the Values of your Keys. This settings ensures that you at least one completed Pair, the Key and Value, is filled. You can choose between the named keys output, or just a generic key output for your XML. A named key will use the name of the key as the node name, whereas generic will just list each pair under a 'key' node. Best efforts have been made for these to support normal Symphony enumerators of +,, and :, but please report any unusual behaviour! Normal default filtering without any *: conditions will search on keys. This will return all the entries where a key of colour exists (whether it has a value or not). This will return all entries where one pair exists that has the value of red. This will return all entries where the Colour key equals red. You can chain this as well with key-equals: colour=red, shape=square that will get all entries where the Colour is red and the Shape is square. This will return all entries where the Colour key contains the word red, e. g. it matches red in blue, green, red. You can chain this as well with key-contains: colour=red, shape=square that will get all entries where Colour contains the word red and Shape contains square. Return all entries where the value in between the given range. An additional third dot allows "more than" (5...) or "less than" (...10) queries. Since the 0.9.5 release, this Field now integrates with XMLImporter. It expects a comma delimited string, eg. red, square. This will populate the first key with red and the second key with square. If there are default keys, these will be pre-filled first. So if the Default Keys for my Meta Keys field were Colour, Shape, the previous string would result in Colour: red, Shape: square. If the string contained more values than keys, additional keys are named as Key $i, where is $i is the index. So red, square, $10.00 would result in Colour: red, Shape: square, Key 3: $10.00. Duplicator updates (orderable and sortable), thanks @kanduvisla! Implement XMLImporter's updated prepareImportValue function, thanks @nilshoerrmann! 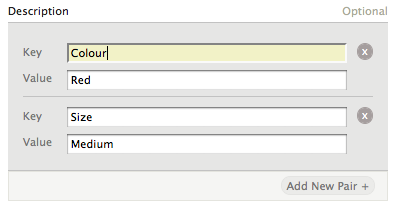 Sanitize keys and allow keys to be assigned a default value, thanks @kanduvisla!